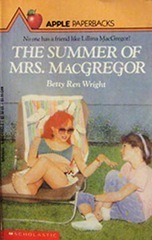 The Summer of Mrs. MacGregor is another 1980s Apple paperback I discovered on Instagram and read on Open Library. Caroline Cabot is twelve and feeling lonely and left out while her beautiful sister, Linda, who has a heart condition, is away receiving treatment in a hospital. Enter Lillina MacGregor. Though, at 17, she isn't much older than Caroline herself, Lillina claims to be married and a model in New York. She dresses very glamorously, and just by association, makes Caroline feel more confident and more interesting. As the summer passes by, however, it becomes clear that perhaps Lillina isn't telling the whole truth and that her beauty and sophistication mask a much more ordinary life than she would admit to having. Though this particular novel is not a mystery, Betty Ren Wright did write a number of ghost stories and mysteries, and some aspects of this book reveal her preference for this genre. Lillina is presented as a mysterious character from the start, and there is a growing sense of suspense throughout the story as the reader begins to see some holes in Lillina's story. Lillina also makes the reader feel uncomfortable at times, as she is difficult to read and does not tell much of the truth. The question of the health of Caroline's sister also casts a somewhat dark pall over the story, contributing to an overall feeling of foreboding and worry. With these mysterious elements, however, there is also a sense of empowerment as Caroline begins to see herself not just as Linda's sister, but as an interesting and valuable person in her own right. Though Lillina may not be what she pretends to be, the attention she bestows upon Caroline still brings about some very real changes in Caroline's perception of herself and her place in the world. Though Lillina is very much a real person, her impact on Caroline's life felt a lot like the way Anna's life is changed by the mysterious Marnie in When Marnie Was There. This book also felt a lot like some of Janet Taylor Lisle's writings, which often involve unlikely friendships with characters who have something mysterious and even sinister about them. I was not expecting such depth and substance based on the cheesy cover of this book, but I was not disappointed to find that the book offers more than meets the eye.